The fact of the matter is that technology is part of our world now; whether we like it or not, whether it terrifies us or it doesn’t, it’s here to stay. The research concludes definitively that without properly integrating technology into your business, there is a slim chance of success. In an article written by Craig Wilson in 2006, he has this to say about technology: “The more successful businesses will continue to understand that technology is a tool to grow and enable their businesses, and they will continue to evolve and do well.” Even eleven years ago, the future was clear. If you integrate technology, your practice will succeed. And as we head into 2017 with open minds, technology continues to contribute to not only the success of your business but to the simplification of menial tasks and the connection between you and your patients. 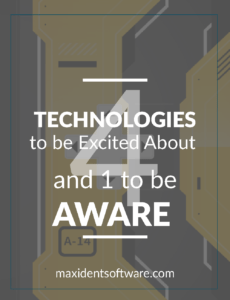 But there is a downside to this new era of smartphones, virtual reality, and chatbots; Before we delve into that, though, here are four new technologies for you and the rest of your dental team to be excited about. The ease in which technology allows you to communicate with patients, fill out charts, and perform treatments in a minimal amount of time, is at times astounding. Let’s look first at artificial intelligence. I know what you’re thinking right now: how can a concept borne out of sci-fi novels and conspiracy theories actually find a place in your dental practice? Well, believe it or not, it’s happened. Maxident’s digital charting software utilizes this technology to learn your procedure codes, the dentistry you do, and even adapts itself to your style of dentistry and workflow to improve productivity and data accuracy. Technology has far advanced beyond our wildest dreams and is only going to continue its journey forward. As technology advances, the items that had at one time needed a lot of space, now can be picked up with one hand. One example that comes from computerhistory.org is the computer. We have come a long way with technology and the Intraoral Camera is one such advancement that has brought the entire dental industry reeling into the future. They are not only handheld but they can also connect by USB and can be completely wireless. And just like the smaller computer built with a capacity to hold so much more data, the intraoral camera of the twenty-first century supports unlimited channel. A feature to intelligently calculate patient portion every time, even if a policy has a lot of stipulations. And the biggest breakthrough in patient communications yet– The Patient App. This app can connect you to your patients despite your busiest schedule and with just the click of a button, their needs can be met by you and your team without even picking up the phone. Right now I bet you’re thinking, wow! Technology has the capacity to do just about everything. And you’d be right. But let’s look at those oh so important words — just about — shall we? Technology does, in fact, make things easier, and a lot more mundane tasks can get done a lot faster, but this is where we need to remember that even though technology solves a lot of problems, it can just as easily create them if we take advantage of it. Sometimes, the more advanced the technology, the less connected we actually become. Why? Because instead of working with technology, we expect it to work for us., making us lazy, sometimes to the point where one-on-one patient care is abandoned in favour of sending emails or texts. It doesn’t have to be this way. It is important for you and your team to work in concert with technology, even coupling older technologies– such as your telephone– with newer ones. Don’t let your phone gather dust. And don’t ever forget that the best form of communication between you and your patients is always a person-to-person interaction. What other new technologies have you discovered? Please feel free to leave us any comments or questions in the section below and keep watch for my next blog that will provide you with tips on the best ways to integrate even the newest of technologies into your practice successfully.